I think the hood and grille have been changed. The engine serial # is a 1953 casting date, the trans casting date is an “X” which is 1952 matching the serial number on the bolster. Those are the only 2 casting dates I checked this morning. It is possible. Some owners when changing parts out go to more lengths to make it look good and original so who knows. They could have decided they wanted the underslung exhaust too since the new hood didn't have a hole for the old exhaust. The Cub looks in good condition in your pics. It has the long air cleaner intake pipe, above the hood, like the 1947 - mid 1954 Cubs had. The mid 1954 Cubs, after the change at serial number 185001, had the short intake pipe above the hood. 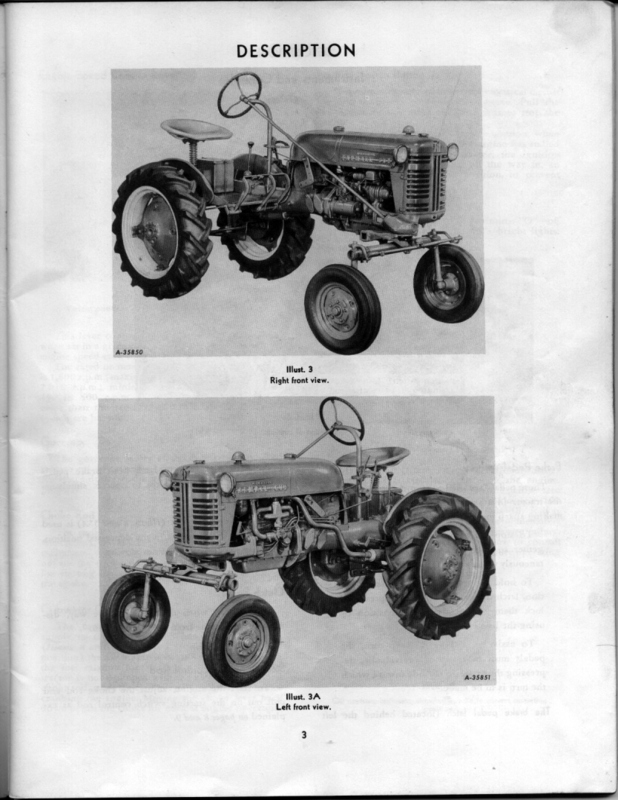 Below is a page from the 1955 Cub owner's manual showing the pipe, and the hood and grille. If the hood was originally white on the sides, where the names are, and the grille was originally white, they were from a later 1956 - mid 1958 Cub. But they have said on here that new grilles from IH parts were white for some time after the Cubs with that style of white grille were made. Look and see if it has the thicker metal Touch Control arms and rockshaft, used from serial number 185001 and above. I guess it has the assist spring for the Fast Hitch, hard to see it in the pic, if it is the smaller size rockshaft, someone probably welded on the arm for the spring. I think you have done that before too. Here is info from TM Tractor, they give the shaft diameters with the different bearing pics. congrats Shane, looks like you made a haul! Indy4570 wrote: congrats Shane, looks like you made a haul! It was a good haul. Got it all off. Last edited by Shane N. on Fri Jun 22, 2018 8:18 pm, edited 1 time in total. Put the tractor in reverse and left the switch off and kept bumping the starter and backed it off the trailer. Drove it to the shop was running good until I hit a bump and the battery cable came off. It’s not charging, lol. This disk has “cub” on it. Just noticed it after unloading it. Mower and platform carrier frame. Last edited by Shane N. on Fri Jun 22, 2018 8:19 pm, edited 1 time in total. Blade, extra rear wheel with center and weight and 2 pieces of hare. Last edited by Shane N. on Sat Jun 23, 2018 6:45 am, edited 1 time in total. Cultivators. Forgot to get the grille out of the truck. Got the grille set on. Thanks Glen. This one is the 1 3/8” shaft (paint and rust is making it a little bigger than 1.375”), our other one I welded the piece on is 1 1/4”. Here’s the casting number off the TC housing too. Talked with a friend this morning and ask him if he had an adapter for a Cub PTO to a 6 spline, he said I happen to have one and don’t need it, it was in the toolbox of a tractor he got at an auction a while back. Ask him about a PTO shaft, he said come see me. I think I can make this all work. Just noticed these two things as well.